Looking at the culture of our generation, everywhere I turn I see dysfunction and distortion in all the areas of our legacy. When we think of the foundational things that constitute our legacy, what is more foundational than truth? This is basic to our character. But truth is thought by many to be ambiguous, variable or even irrelevant. So I’ll ask the timeless question: What is truth? Now, we don’t want to get too abstract about this, but for people to make better choices in life and change the course leading to bad results, isn’t it vital to believe and commit to what is true? 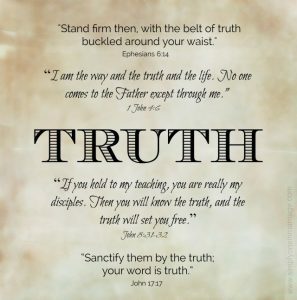 And ultimately all truth brings us to God… even Jesus Christ who not only declared that He is the Truth but IS, as Paul wrote, the ONE in whom are found all treasures of wisdom and knowledge (Colossians 2:3). If that is true, then the more we spend our time with Jesus in His Word, reading and meditating on it and interacting with His Holy Spirit to confront ourselves about our personal lives, then the more we are going to see truth expressed in our life. Let’s make that question personal. You can aim it at your conversations with anyone. Do they want to know what’s true? If they don’t care about truth, then your conversation will sadly stay on trivial things like sports, the weather and all the distractions of life. You can pretty well tell what people really believe because their actions tell you what they have trusted to be true. In the marketplace we all tend to buy and consume out of habit. We follow the habits of others, usually our family members and friends, but then we are persuaded to make changes based on all kinds of advertising campaigns. We’re persuaded by all kinds of influences in our lives. But remember that the “end” of our legacy is about having a positive influence on others, right? In a similar way, we ‘buy into’ various ideas because of what we’ve either passively accepted to be true or because we’re persuaded to make a change. Here is the crux of the matter. If we are presented with a new idea or a new option, are we willing to take the time to investigate it? That process of evaluation and careful analysis is a legacy of discernment that we can pass on to others who learn it themselves by watching us go through that testing process with things. And with all the confusing messages swirling around our society these days we desperately need to be alert to the implications of our choices. Too many people today are quickly distracted by subtle novelties that can end up taking them way off track from the truth. We are not babies that can easily be distracted to play with another toy. Yet, in a society that is flooded with media advertising and highly persuasive marketing techniques, it’s clear that a large segment of society is easily deceived and misled. But what is really true and what are the choices we really want to make for the sake of our positive influence on those we care about, especially our next generation? Does it matter if our leader’s character is questionable? Does it matter if our child’s education is tainted with ‘poisonous’ attitudes, ideas and errors? Unfortunately, when we open that discussion, a lot of people can get a bit defensive. Whether it’s on the television or in the classroom, does it matter what we allow our children to be exposed to? And we could add more. Does it matter if the motivations of our trusted sources of medical knowledge and food preparation have been compromised by corruption and expediency? Just because it tastes good or because the pharmaceutical company advertises it to be completely safe, are you going to take their word for it without testing it for yourself? It’s our body and mind that we are putting these products and ideas into. Discernment is needed more than ever. How do we know if we should trust a particular business plan or banking arrangement when it comes to our finances? And is it safe to let our influence, our vote, our ideals be compromised by institutions and special interest groups whose foundation is built on error, deception and corruption? This is why it’s appropriate for a thoughtful person to ‘put everything to the test.’ It’s not because we’re cynical or negative. It’s because we are surrounded by deception from influencers who have all sorts of agendas and ulterior motives. Regardless of our experience or maturity, we all need to be educated. So how do we know if we can trust those who are doing the education? Discernment is vitally needed. As believers who are growing in our expressions of love and service for others, Paul’s exhortation here is for that love to grow in real knowledge of what’s true, with all discernment. Then you will (as we’re told in Proverbs 2:9), “discern righteousness and justice and equity and every good course.” Who gets this discernment? I guess you could say that discernment is really needed for all aspects of life (spiritual and practical) because all these things connect with God’s ultimate wisdom. In Hebrews 5:14 we’re told, “But solid food is for the mature, who because of practice have their senses trained to discern good and evil.” Could it be that we lack discernment sometimes because we have not practiced the development of maturing to the extent that we should? That takes time alone with God; time in His Word, time in prayer, time in fellowship with others in meaningful conversation and interaction about deeply important insights for life. An appropriate warning should alert us all as to the company we keep. Proverbs 14:7 tells us to “Leave the presence of a fool, Or you will not discern words of knowledge.” If you’ve been hanging around the wrong crowd, that is going to drastically affect your ability to discern words of knowledge. You need to be discerning about the company you keep regularly. So, do we want to re-establish a wise and Godly legacy in our generation? In society today, character is so compromised that it seems normal when we don’t even trust ourselves. Education is so corrupted and ‘politically correct’ that the basic life skills are marginalized while true history is revised and ‘rewritten.’ Health and Wellness is failing badly as nature is ignored in favor of synthetic ‘remedies’ and even synthetic ‘foods.’ Wealth is perverted by forgetting the purpose of it to establish Godly influence in human lives. And influence has become more about ‘buying’ power than leading others to discover the truth. Some are so discouraged by current circumstances that they don’t bother hoping for a revival of truth and sanity in our society. But society is made up of communities. And communities are made of institutions, families and individuals. There is no doubt that the many ‘attacks’ to break down the family unit are strategically demonic. Government and special interest group leaders may be the instruments of the attack but the “conspiracy” is much bigger than any man can contrive. The question is what do we believe? Our beliefs will govern how we act. And if we believe the devil is the winner, that his plans will be victorious and that we must hide out till Jesus comes back, then we will do practically nothing to change anything. Martin Luther and William Tyndale would have given up on their vision to have every common person know the truth of God’s word that could lead them all to Christ. Do we have to watch the world slide into another Dark Ages before we can expect a reformer like Luther to have the courage to stand up and say something on the most visible platform of society? What is that platform? The media and the Internet, as well as the communities where we actually gather are the platforms where we are being influenced. And they are the places where we need to courageously be involved in the discussion with a God-fearing attitude of meekness, gentleness and respect. If truth is ambiguous or indefinite how can anyone know if he believes it? What is truth? There are all sorts of scriptures about truth. (See Unlocking the Mysteries of Creation, pg 14-sidebar) But not being known doesn’t stop the truth from being true, does it? Not being known doesn’t stop the truth from being true (ref: Richard Bach). “Truth is so rare that it is delightful to tell it.” That’s what Emily Dickinson said. “Truth is beautiful, without doubt; but so are lies.” So said Ralph Waldo Emerson. “God is, even though the whole world deny him. Truth stands, even if there be no public support. It is self-sustained.” That’s what Mohandas Gandhi said. “Truth provokes those whom it does not convert,” as Bishop Thomas Wilson said. Sometimes truth makes people angry. So what kinds of things can be done by a believer to help restore truth to his community? To his family? To his work place? Ask church leaders to define and lead studies on foundational truth. Start a habit of talking with family at regular times about basic truths. What do you believe about life, about relationships, about God? Why do you believe those things? What do you believe about the Bible? What do you believe about where you go when you die? Why would you believe that? Covenant with a study partner to pursue truth together on a regular basis. Keep a journal about truth. Will you be pro-active with your legacy? Will you seek to maximize the influence you will have on your generation by taking the truth to heart and engaging the challenges of a distorted view of truth that surrounds us in our world today? If so, you’re bound to have opportunities to stretch yourself as early as tomorrow. And once you’re stretched (or vexed) by the exercise, you’ll never be the same. The legacy you leave will be increasingly appreciated by those whose lives you influence. And that is what legacy is all about – influencing others in a positive way – particularly leading them to the Savior so that they might know him and His wisdom during this time we spend on earth so they might spend eternity with him in the future.